The art of face reading goes back thousands of years in China. According to The Chinese Art of Face Reading: Book of Moles, if you want to know about a person's reputation, nobleness, wealth, blessings, and longevity, look at their forehead, eyebrows, nose, mouth, ears, and chin. If there's a mole at any of these places, it emphasizes what they represent. Chinese face readers believe that where a mole is located on your face says something about you and that moles serve as reminders to be more vigilant about these aspects of your life. In Chinese face reading a mole on the forehead says something about your parents, spouse, luck, career prospects, and thinking. It also denotes opportunities, intelligence, reasonableness, and foresightedness. A mole at the hairline suggests good luck, the deeper into the hairline it's hidden, the better. A mole in the center of the forehead suggests an overly sensitive person who probably had unfavorable relationships with her parents or spouse. A mole on the right at the center of the forehead indicates mental maturity, no shortage of material things, possible fame, and peaceful and happy later years. 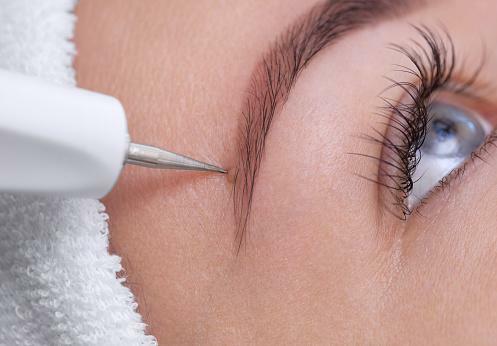 A mole in the eyebrow area indicates you should pay attention to your nature and temperament. It also denotes wisdom and individual behaviorism. A mole hidden in the eyebrow indicates that the person tends to study well, has a higher education, is ambitious, decisive, able to lead others. Said person will also have good luck due to the presence of influential people in her life. A person with a mole here may also have a hidden talent. In the center of the forehead, a mole suggests that the person has a pessimistic attitude, worries, and is likely to encounter setbacks in her life. A mole above the brow arch indicates a sharp and creative mind. On the edge of an eyebrow, a mole denotes travel and a tendency toward domestic instability. On the nose, a mole draws attention to your self-esteem and social status. A mole at the bridge of the nose suggests the individual will constantly face problems in health, marriage, and wealth. The mole on the tip of the nose indicates the person lives above her means, finds it hard to save money, and will have personal financial losses. A mole on the nose wings suggests personal financial losses, especially at the age of about 50. Moles on the chin draw attention to your tenacity, assertiveness, endurance, and work ethic, as well as properties and wealth in general. A mole in the center of your chin just below the lips indicates a person who is very conservative in managing her finances. This person also likes to argue and debate. A mole in the center of the chin suggests the person will enjoy a stable life, good luck, and prosperous family as they grow older. A mole at the bottom of the chin (right, left or center) suggests fame and glory. 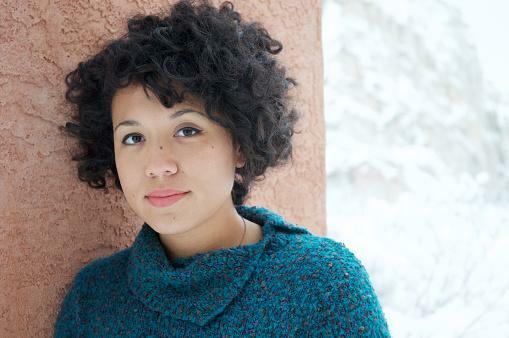 Moles on the cheeks tell the story of a persona's industriousness, power, and authority. A mole on the cheeks near the upper lip suggests the person is sentimental and always considerate of others. 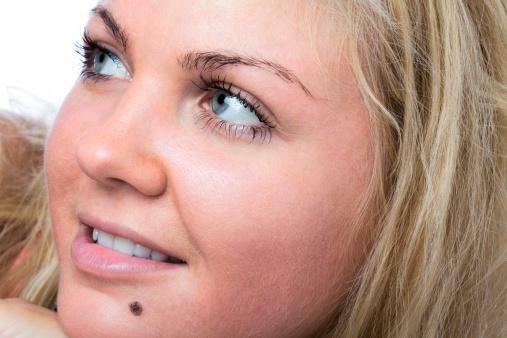 A mole on the round part of the cheek suggests a person who is self-absorbed and self-centered. 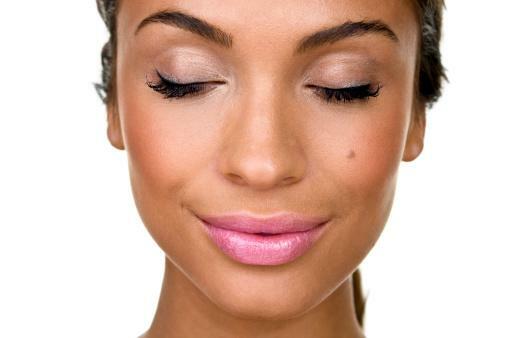 On the left cheek, a mole denotes a person who is wasteful. A mole located on your upper cheek near the outer edge of the eye denotes romanticism and a problematic love life. A mole on the ear is said to be a blessing and to reveal something about a person's talents. 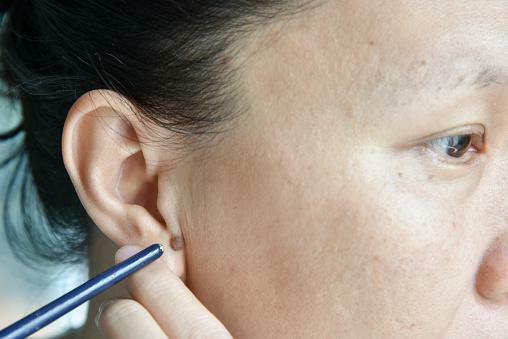 A mole on the left ear indicates the person is emotional and may excel in the humanities. Chinese face readers believe that facial moles can be lucky or unlucky, depending not just on the location of the mole, but also on a mole's shape and color, as well as on the gender of the person. A round mole signifies the goodness in people. An oblong mole depicts a modest share of acquired wealth. An angular mole suggests that the individual has both positive and negative characteristics. A mole that's protruding, smooth, as well as dark and pure in color is considered good. A flat or concave mole that's dull or gray is considered bad. A mole can mean something different for a woman than a man. Gender does make a difference. Mole readers believe that moles have an influence on your personal, private, and professional life, as well as your health. If you're a believer in mole reading, you may be concerned. However, those who practice this ancient art believe you can protect yourself from harm and that moles don't indicate an unchangeable destiny. As a matter of fact, many people have their or their children's facial moles removed for just this reason. Rest assured that regardless of what your moles may say about you, you can control your future.